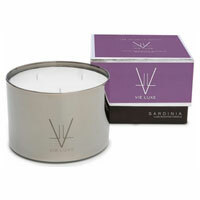 Vie Luxe by Marjorie Gubelmann candles, scents and fragrance list. Vie Luxe by Marjorie Gubelmann home fragrances: Vie Luxe International is a luxury home fragrance company founded by Marjorie Gubelmann in 2004. The Voyage Collection inspired by Marjorie's favorite international vacation destinations. Capri, Maldives, Palm Beach, St. Moritz, and Tuileries launched in 2004; Cote d'Azur (2005); Buenos Aires (2006); Istanbul launched 2007; St. Barth's (2008); and Sarninia (2009). The environmentally friendly, Eco-Luxe Collection, launched in 2010 with Verte, Blanc, and Bleu.